That's right, today is our wedding anniversary. We made it! I'd heard rumours that it's all downhill from tying the knot, but I have to say (soppy bit to follow) that I've really enjoyed being Mrs/Ms/Miss Rock not Barnes and I'm really happy we decided to do it. It's weird to think how much fun I was having at this moment last year in comparison to right now. But it's not all doom and gloom- we're off to Dubai on Wednesday for a between anniversary and birthday celebratory mini break! So exciting. I've wanted to go to Dubai for so long, and now after living right next door for 10 months we're finally going there. I'm not ashamed that the main reason I'm excited is because of alcohol!!! I've been wondering recently if I'm a small scale alcoholic; I think about alcohol a lot of the time and find things more boring without it. But then again, maybe It's just that things here are generally boring and alcohol being illegal probably makes me want it more. It's not only the alcohol I like, it's all the stuff that comes with it. We're planning to go to a couple of bars in Dubai, and the simple idea of soaking up the atmosphere or, wait for it, talking to some people, fills me with complete glee. 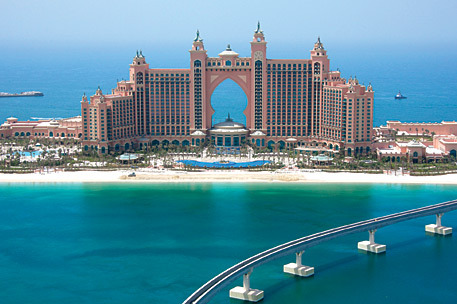 Walk on the man made island up to the Atlantis hotel for a drink. We wanted to stay there but at 450 dollars a night it was a little unjustifiable. Go to Wild Wadi waterpark. Enjoy an infamous Dubai brunch, which includes all you can eat, and more importantly all you can drink, before flying home on Friday. Atlantis Hotel- just look at it! It even has its own theme park. And that's about all we can pack into the two day, two night visit. Bring it on.